A hectare is a unit of measurement. It measures the area of something, most often the area of land, or of very large buildings. 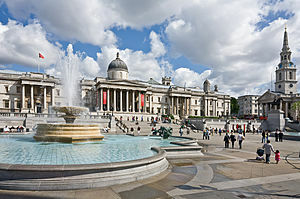 It is equal to 10,000 square metres, or a square with sides of 100 by 100 metres. It is equal to 2.47 acres. 100 hectares is one square kilometre. Therefore, a farm with 200 hectares of fields has 2 square kilometers of fields. The word hectare means 100 ares. Hecto is the metric system prefix meaning 100 times. Are is a metric system unit of measure for area, equal to 100 square metres. 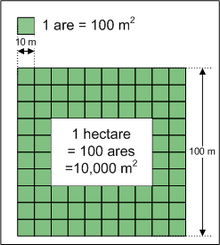 A square plot of land with 100–metre length for a side, is one hectare. It is about the size of a European football field. ↑ "DEPARTMENT FOR ENVIRONMENT, FOOD AND RURAL AFFAIRS, AND RURAL PAYMENTS AGENCY; The Delays in Administering the 2005 Single Payment Scheme in England" (PDF). National Audit Office. 2006-10-18. Retrieved 2010-02-24. This page was last changed on 26 February 2016, at 04:17.